For more than half a century, Sunset Moulding has been in the business of creating the best quality moulding & millwork products available. 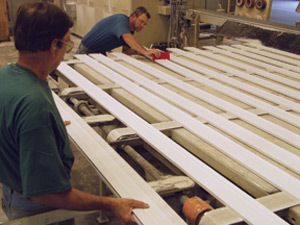 Manufacturers of the Suntrim MDF line, the company supplies the distributor market with lineal, cut-to-length, solid wood, finger joint and specialty moulding and millwork products. 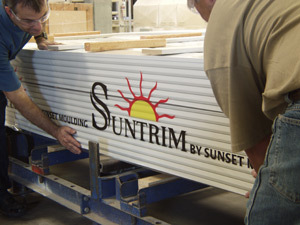 Sunset is dedicated to supplying its customers with top-quality choices in both wood and Suntrim products. 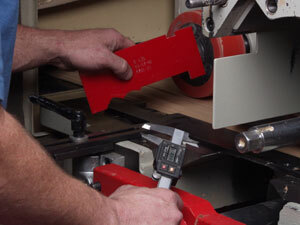 Matching the shape of existing moulding can be a tricky process. If the new profile doesnt match perfectly, the results can be costly. To solve the problem, Sunset Moulding offers a state-of-the-art service that ensures all mouldings match perfectly to the original profile provided. Utilizing an advanced AutoCAD system, a template is created with the exact dimensions of the cut of the original profile. The template is kept on file and used to ensure the results of each subsequent order are an exact replica of the original pattern. The company is known throughout the industry for its packaging practices. Sunset products are packaged with special care and arrive at your warehouse on time, and in exceptional condition. Customers also appreciate Sunsets flexibility, quick turnaround, and willingness to create mixed shipments whenever necessary. 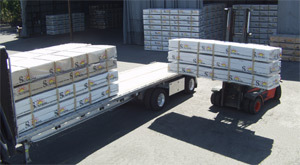 To help customers control inventories, Sunset has a unique ability to supply finger joint and solid wood mouldings and millwork, plus Suntrim, all on one truck.